His Eminence Yongdzin Lopön Tenzin Namdak Rinpoche granted the lineage of initiations of the three different cycles of the Yungdrung Bön doctrine: external, internal and secret cycles. These are also known as the path of renunciation, path of transformation and path of liberation. The lineage of these initiations comes from Buddha Tönpa Shenrab Miwo, the founder of the Yungdrung Bön tradition. The source of each initiation originates from the three Enlightened Bodies (kayas): bönku Kuntu Zangpo, dzoku Shenla Ökar and trulku Tönpa Shenrab. The doctrine and initiations were passed on from the three kayas to the Mother (Yum) Zangza Ringtsun, the Son (Tonpa) Chimed Tsukphud, (Shen) Sangwa Dupa, and to the accomplished great male and female Masters and Lineage Holders. These teachings came into Tibet from the kingdom of Zhang Zhung. According to the Yungdrung Bön history the doctrine spread in Tibet in three different periods. During the later period several treasure revealers (tertön) appeared. The main tertöns are called Shen Gyer Majyil, Shenchen Luga, Gyermi Nyiwo, Maton Sroldzin, and Jyilton Khyunggod Tsal. They transmitted the doctrine to the six principal holy families, which were Shen, Dru, Zhi, Pa, Me, and Khyung families. During this later period transmissions, initiations and the whole Bön doctrine became rediscovered and firmly established in Tibet. The lineage has three different sources. The first, known as Kama, comes directly from the Buddha up to the present time in an uninterrupted lineage. The second, known as Terma, was hidden in difficult times and later found by the tertöns. The third, known as Nyengyud, came from the highly realized beings (Buddhas, Khandros and Masters), who appeared spontaneously and gave direct ear-to-ear transmissions. Yongdzin Rinpoche received these direct transmissions, knowledge and blessings from his Masters. Yongdzin Rinpoche was enthroned in 1959 as Lopön of the Menri Monastery, which was the principal monastery of the Yungdrung Bön lineage in Tibet. In that connection he received the special instructions and empowerments from the most realized Yungdrung Bön Lamas at that time, including His Holiness the 30th Menri Trizin (Abbot) Tenpa Lodrö, His Holiness the 31st Menri Trizin Nyima Wanggyal, the Head Master of the Kharna Monastery Yungdrung Gyaltsen, the main Master of the Yungdrung Ling Monastery Lopön Tsultrim Gyaltsen, and the previous Head Master of the Menri Monastery Yongdzin Sanggye Tenzin, as well as Shen Dzam Ling Rinpoche from the Shen family. Yongdzin Rinpoche received many important initiations and teachings of external, internal and secret doctrines. In this way he got all the knowledge and blessings of the lineage and became the most important Lineage Holder of the Yungdrung Bön tradition. In 1959 Yongdzin Rinpoche went into exile. His main mission and responsibility was to preserve the heart of the original Tibetan culture and tradition. In 1966 he founded the Tibetan Bönpo Foundation in India and helped Tibetan Bönpo refugees by establishing them a settlement Thobgyal Sarpa in Dolanji, India in 1967. After the demolition of the Menri and Triten Norbutse Monasteries in Tibet, Yongdzin Rinpoche re-founded these two principal Yungdrung Bön monasteries – Menri in Dolanji and Triten Norbutse in Kathmandu, Nepal. Yongdzin Rinpoche together with other important Bönpo Lamas appointed His Holiness the 33rd Menri Trizin Lungtok Tenpai Nyima Rinpoche in the traditional way in 1968. Together they re-established the academic education of the traditional meditation curricula and the dialectic school. In 1984 Yongdzin Rinpoche transmitted his knowledge and gave special Bön initiations – external, internal, and secret – during one month to His Holiness, Bönpo monks and his followers in India. He restored successfully the traditional meditation and academic traditions and thanks to his great diligence the Yungdrung Bön teachings are nowadays flourishing all over the world. In 1986 Yongdzin Rinpoche had for the first time the opportunity to visit Tibet after his exile and to meet also his mother after 45 years. At that time he went to central and east Tibet, where he met many Bönpo Lamas, monks and lay people. During his visit he reintroduced the tradition in Tibet and gave many initiations, transmission and instructions to people there. He himself also received many initiations and transmissions, which he had not received before his exile from Tibet from highly realized Masters like Rakshi Tokden Drimed Yungdrung and other high Tibetan Lamas. When he came back to India he transmitted these initiations and knowledge to His Holiness Lungtok Tenpai Nyima Rinpoche and others. Yongdzin Rinpoche visited Tibet the second time in 1992. During this visit he gave special Maguyd tantric initiations and Dzogchen teaching to Shen Family and other people. 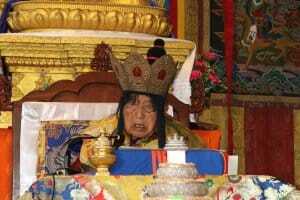 Yongdzing Rinpoche gave all the initiations – external, internal, and secret including also the dharma protectors – for the second time in connection of the enthronement of his heart son, Lungtok Tenpa Yungdrung Rinpoche as Khenpo of the Triten Norbutse Monastery in 2001. In this Earth Pig year 2019, at the age of 94 Yongdzin Rinpoche gave for the third time the initiations of the three cycles – external, internal, and secret – together with Kenchen Tenpa Yungdrung Rinpoche to new Geshes and other people at the Triten Norbutse Monastery.